You envision purchasing a mobile container office or equipment enclosure, but then it hits you: how will your container get from point A to point B? Following are some helpful insights from the Falcon Structures logistics team. For the purposes of this blog, we’ll focus on structures made from single shipping containers. How are modified shipping containers usually transported? We ship containers by truck. The type of truck we use depends on the situation. If you’re moving a container less than 200 miles, we recommend using a tilt bed truck. The bed of a tilt bed truck can be tipped at an angle, so the cargo can be slid off the bed. This means that the driver is able pull up to the desired site and set the container down on the ground with no additional equipment. Be aware that a tilt bed truck requires a significant amount of room to access the location where you want the container placed. The ground where your container will sit also needs to be is dry, firm, flat, and level. Beyond 200 miles, it is usually more cost-effective to use a flatbed truck because tilt beds, being less common, cost much more to operate per mile. A flatbed truck has a simple fixed platform with no surrounding walls. Thus, you will need a crane or forklift to move the modified container on and off the truck bed. Because high-cube containers are 9.5-feet tall—a foot taller than a standard shipping container—transporting them calls for a step-deck truck. 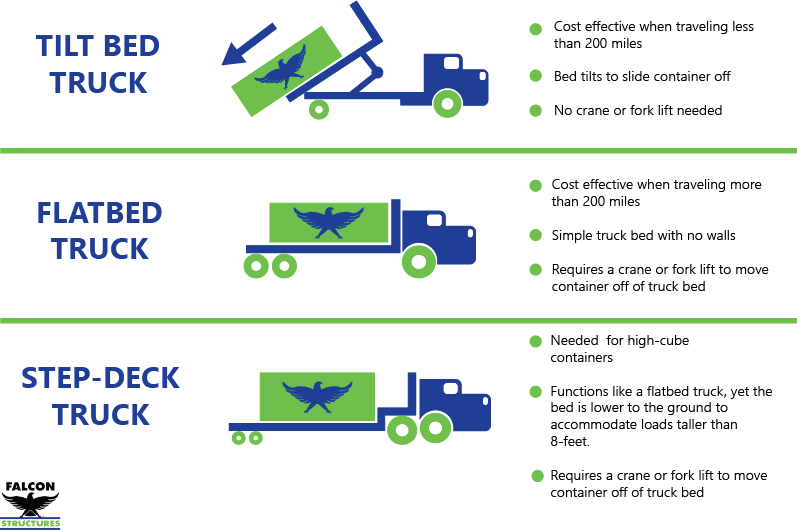 Step-deck trucks are similar to flatbeds in that they have a fixed, flat platform, but step-deck platforms are lower to the ground to accommodate taller loads. Like a flatbed, a step-deck truck requires a crane or forklift to move the container off the bed. What about transporting my shipping container by train? Traveling by rail can be a viable solution if the point of origin and final destination are near rail lines. However, you must be prepared for additional logistical considerations. You may have seen trains carrying shipping containers. These containers are unaltered and carry goods. Because a modified container will not be carrying the rail line’s freight, it will be treated as a very large piece of cargo. This may make rail lines hesitant to offer space on the train. You will also need to make plans to transport the container to and from the railyard. Alongside paying for cranes and trucks, railyard certifications may also be required. The added time and costs associated with shipping by rail can stack up quickly. Falcon Structures hasn’t yet encountered a situation where it would be the best solution for the customer. How will I get my container off a flatbed or step-deck truck? How you will remove the container from the truck bed depends on the size of the container. If the shipping container is 20-feet long or less, a forklift with 6-foot tines can lift the container by its built-in pockets. If the container is any larger, you will need a specialty forklift with 8-foot tines because 6-foot tines risk popping through the flooring due to the additional weight. We have found that renting a crane is often the most cost-effective option for customers with larger containers. Thanks to their built-in corner castings, shipping containers are easily rigged for crane transport. What about shipping a container by boat? Containers were built for overseas shipment, and we have delivered modified containers by boat in the past. However, certain modifications may make containers less watertight. There will also be additional costs and many logistical considerations to move the container in and out of port. Determining if a modified container can or should go overseas is a case by case assessment and should be discussed with your container provider. What portion of the shipping process does Falcon Structures handle for its customers? Falcon handles delivering the container to the customer’s site from our manufacturing facility. We also take an active role in guiding a customer through crane or forklift arrangements if required. We’ve moved hundreds of containers, and we’re happy to share our expertise whenever we can. If you have questions about whether a modified shipping container is right for your business, contact us at 877-704-0177. A Falcon sales rep will be happy to help.